One of the most common causes of sudden vision loss is retinal detachment. The retina is the most important structure in the eye. It is the innermost layer that receives light photons, converts them to electrical signals, and directs those signals towards the brain via the optic nerve. 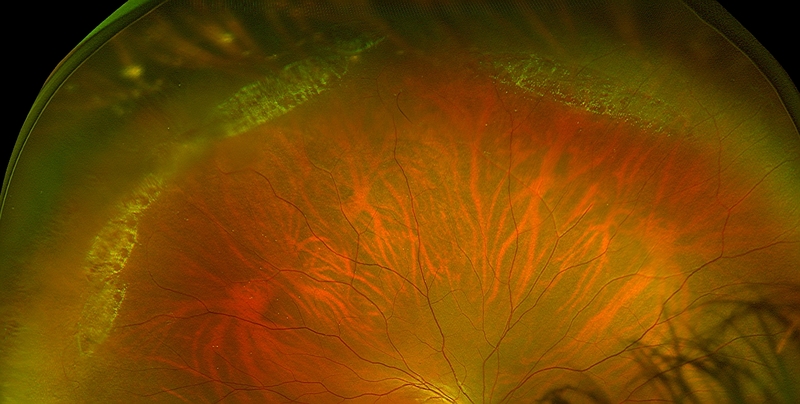 lattice degeneration in the peripheral retina. A large retinal tear and detachment in the top left periphery of this eye. 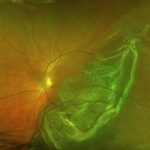 The retina is very thin to begin with, and as we age, it gets thinner, especially in the peripheral retina. It’s like pizza dough; as the retina stretches, it gets thinner. When it gets very thin, it develops scar tissue, called lattice degeneration, to try to prevent tearing. If it does tear, then eventually fluid from eye inner eyeball can rush through the retinal break and detach the retina from the underlying layer. Wherever the retina detaches, you lose your vision permanently. The retina can entirely, including the central vision. Another cause of these symptoms and of a retinal detachment is a vitreous detachment. The vitreous membrane is a clear membrane that is loosely against the retina. 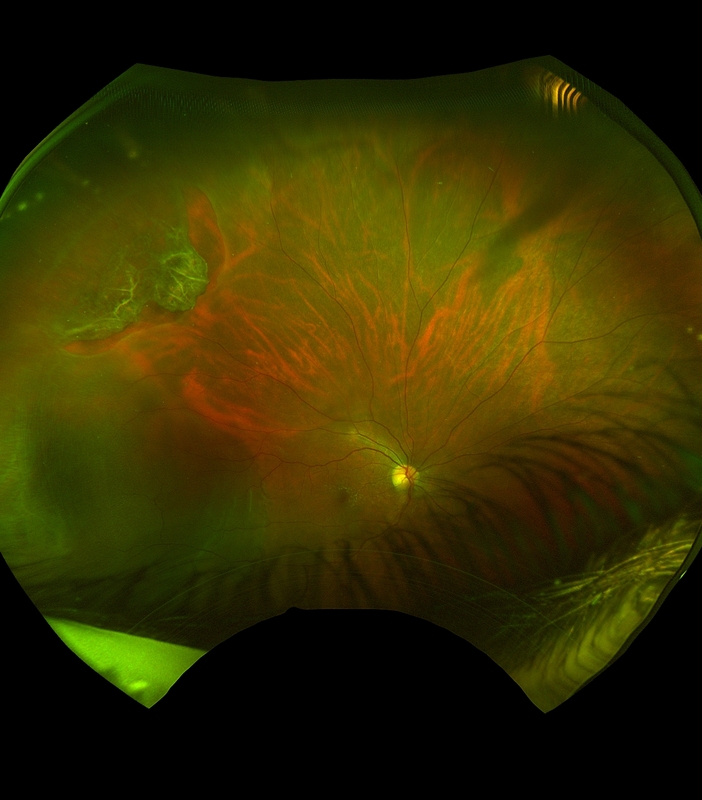 At some point in almost everyone’s life, usually in their 60’s, the vitreous membrane comes off the retina. In areas where the vitreous may be firmly adherent to the retina, it can pull on the retina, causing it to break and beginning the cycle of retina detachment. The symptoms of a posterior vitreous detachment are similar to those of retina detachment in many ways, causing flashes of light and increased floaters. Usually by the time there are symptoms, the detachment is well on it’s way. You may experience strobe lights in your vision, an increased amount of floaters in your vision, or a curtain (like and eclipse) that causes you to lose your peripheral vision. If you experience any of these, call us IMMEDIATELY and let us know you’re coming in right away. People go blind every day from retinal detachments that could have been prevented if they had been caught as a retinal hole, or tear. Retinal breaks occur at any age and can occur without any symptoms. 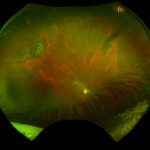 We routinely perform a retinal exam in your yearly evaluation, either by dilating the eye, performing the Optomap with eye steering, or both. If we don’t do at least one of these tests, we are unable to find these retinal holes. We catch retinal tears, holes, detachments, or lattice degeneration every day. 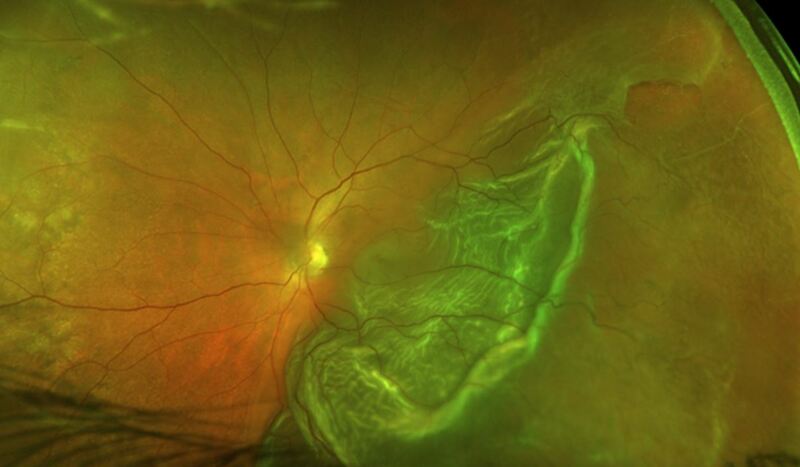 Retinal breaks can be treated easily by laser that prevents them from spreading into a detachment. Retinal detachments are an emergency and require immediate and extensive surgery and several weeks of recovery. If you haven’t had your retina evaluated in awhile, make an appointment with us for an eye exam. 480-812-2211.